The last time Michael Flynn performed his music on stage at Charleston Music Hall it was a concert filled with sentimental and reminiscent moments as his band Slow Runner bid farewell. Michael Flynn and Josh Kaler comprised the songwriting duo which was Slow Runner, but with this project Flynn is flying solo for the first time, free to fully explore his late night electronic dreams. The results are stunning. Flynn has always been able to toe the line between whimsy and baffling beautiful. There are points in the second track on the album “Winsone Loneseome” (the three-minute mark really gets me) that could make even The Great Santini weep joined later by the track “That Danny Glover Feeling” a title that coerces a wry smile. The album is full of moments that tug you in every direction emotionally just like every day life. 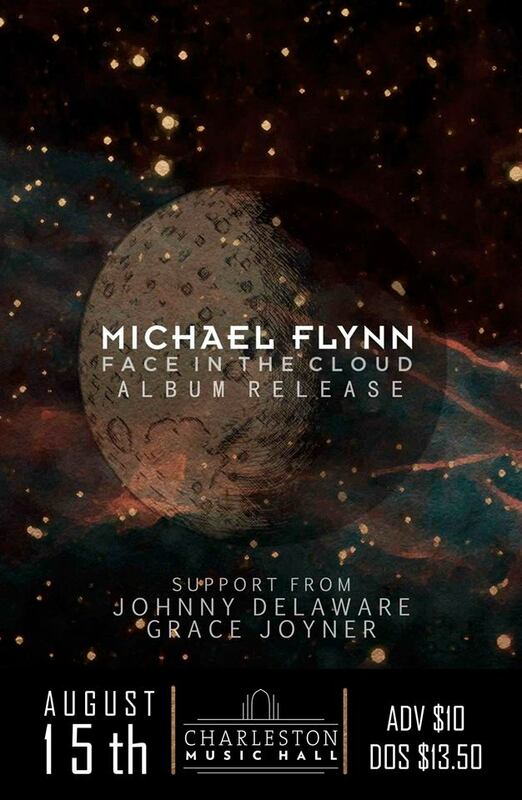 More than ever Flynn shines as a composer on Face in the Cloud where in the past he was more of a dual-threat wrecking ball both lyrically and musically. Released in the heart of summer Face in the Cloud has received a warm digital welcome with a single début at The Wild Honey Pie, love from nearly every Charleston media outlet, radio airplay from the WXPN show ‘Echoes,’ and tons of love from Charleston City Paper. Accompanying the album release Flynn has released a series of live performance videos that show a behind the scenes look at where he recorded the new album and an idea on how it will translate live. Magical isn’t it? At that Slow Runner farewell show I filmed from the front row of the balcony as South Dakota transplant and songbird Johnny Delaware mysteriously took in the sounds from a dark corner on the side. Friday night he’ll be opening the show along with Flynn’s Hearts & Plugs label-mate Grace Joyner who is also out promoting her new album.